using the natural aides of leg, voice, weight and hands. 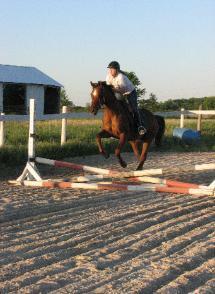 We also allow and encourage students to haul in their own horses for lessons. Horses must have a current negative Coggins and vaccines. 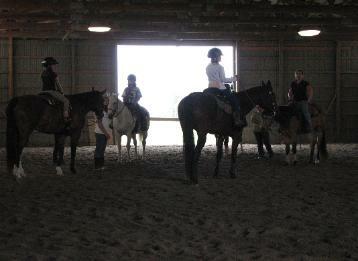 aspects of safety, horse care and riding. Q: How old does a student have to be in order to take lessons? normally ride for an hour. Q: When do you schedule lessons? How long is a lesson? to 5pm. We are closed on Sundays. Lessons are a half hour or an hour in length. Q: What are your lesson prices? hour. We offer lesson discounts to boarders and lessees. Q. How early should I arrive for my lesson? are other lessons in progress. Q. Where do I go for lessons? free to come on in! Q: What would I learn in a typical first beginner/novice lesson? chance to meet the horses. We will review and sign a liability/lesson agreement. teach a 2-3 hour lesson? 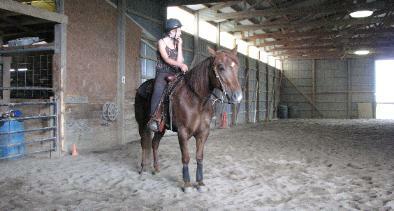 Q: Does my child need to wear riding attire? wear an ASTM/SEI approved riding helmet, which HMA provides free of charge. Q:.Do I need to bring my own tack? 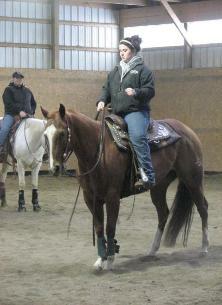 bring your own tack, then it needs to be checked by an instructor first. Q: What is your policy if I need to cancel or reschedule a lesson? the cancellation of your lesson package without a refund. made up at the client's convenience and will not be subject to forfeiture. Q. Are lessons offered year-round? months, as long as the conditions are safe. A: We gladly accept your personal check, cash or credit cards through Paypal. Q: Do you offer any lesson packages? Q: Do you offer boarding or leasing? lesson program. Please contact Jezzie for more information. Copyright © 2008-2009 Jezzie Lowe Harvest Moon Acres LLC. All rights reserved. You are not permitted to copy any material from this site without written permission from the author.